Scaffolding is a common sight on construction sites and for accessing hard-to-reach areas such as roofs or multi-storied buildings in both town and country alike. It is such a familiar presence as we go about our day-to-day lives that most of us don’t usually give it a second thought! Scaffolding has been used throughout history ever since the first structures were built, but when exactly was that, and what is the history of scaffolding? Here we explore the history of scaffolding and investigate how it became the irreplaceable, invaluable industry it is today. Archaeologists found evidence of scaffolding next to the Palaeolithic cave paintings at Lascaux in the Dordogne region of France originating a staggering 17,000 years ago. Sockets in the walls reveal that Palaeolithic people devised a structure resembling scaffolding to reach difficult-to-access areas of the paintings and thus, scaffolding was born. 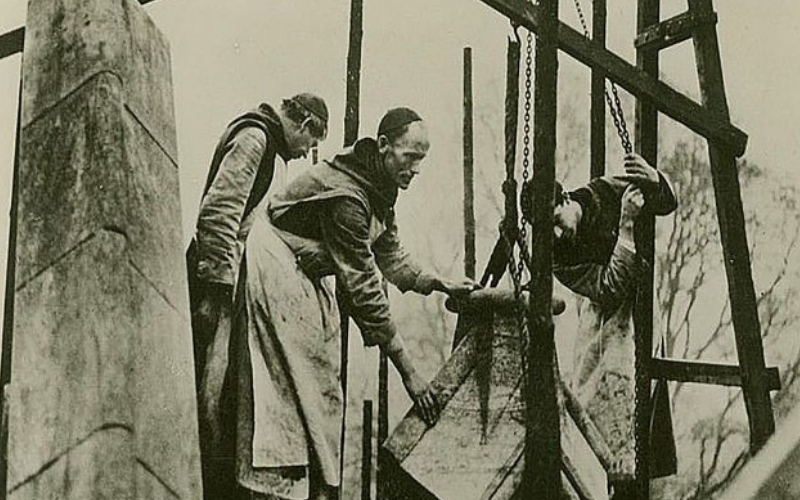 As time went on, monks during Medieval times were specially trained to construct abbeys and churches using scaffolding and the ‘scaffolder monk’ trend continued well into the 20th century. 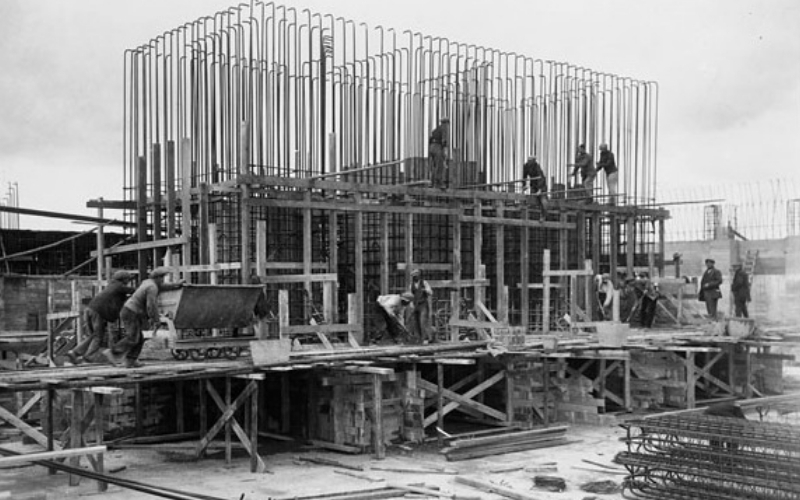 It wasn’t until the early 1900s that metal scaffolding tubes as we know them today were introduced. Prior to this date, lengths of bamboo lashed together with hemp rope were used widely as a method of creating and erecting a scaffold frame. Though lightweight, bamboo was sturdy enough to support the weight of workers and equipment and its weight and durability mean that no machinery is needed to assemble the scaffold and put it in place. The practice of using rope to tie wooden poles together to create a scaffolding structure is still used throughout Eastern countries and even in some parts of Spain and Italy today. In the 1900s a gentleman by the name of Daniel Palmer-Jones (often affectionately known as the ‘Grandfather of Scaffolding’) realised that the newly introduced metal poles for scaffolding had a tendency to slip when tied together with ropes. He (along with his brother David) realised that a set of standard fixings would be a better way of securing both wooden and metal poles alike and, after multiple experiments of varying successes, they eventually came up with “Rapid Scaffixers” which formed the basis of their Patent Rapid Scaffold Tie company. 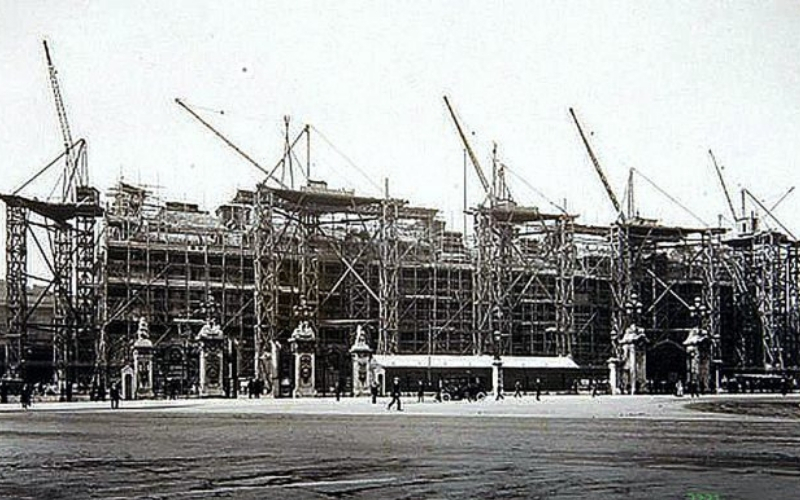 Their invention even lead to them being awarded a contract in 1913 to remodel Buckingham Palace using their new scaffolding system! The design of Palmer-Jones’ fixings developed further and six years after the first prototype, he invented the ‘Improved Universal Coupler’ which soon became the standard pattern used by the scaffolding industry right up to the present day. It was a revolutionary stage in the history of scaffolding to use two-inch water pipes because in standardising the dimensions and parts, it lead to greater safety and stability (which are the pre-requisites of scaffolding!). Along with these, new techniques such as diagonal bracing assisted in strengthening the access structures and helping to improve stability, especially on tall buildings.These innovations in scaffolding really revolutionised our skylines because steel poles lead to stronger structures that could be built higher than ever before. Despite many modern improvements, there are numerous old working practices still evident in the scaffolding industry and types of scaffolding used in the past are still used today. For example, the “block and tackle system” was just as familiar to Roman scaffold workers as it is in modern times. The horrors of World War II meant that huge areas of Britain were bombed and so whole towns needed reconstructing. It was a huge job to put the country back together and a real boom time for labourers and construction workers as there was more work around than there were skilled tradesmen. 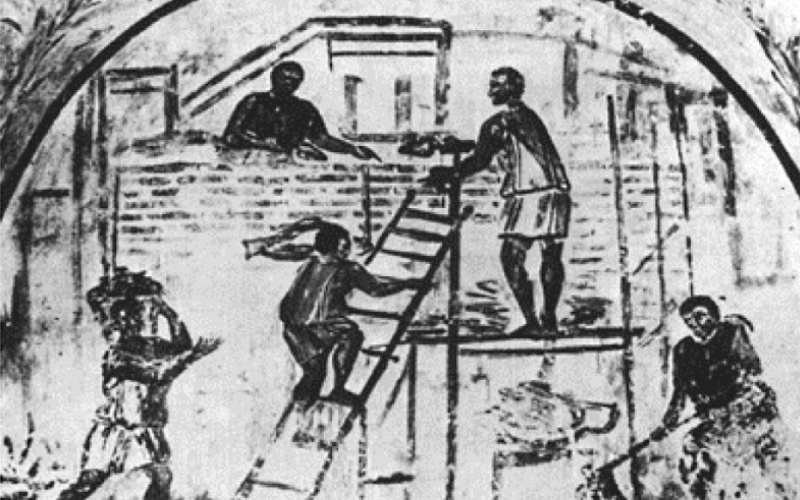 Many sites used unskilled labourers to learn the ropes as unskilled apprentice scaffold workers and safety was a huge issue. Just take a look at this hair-raising video clip!! Nowadays we have strict working regulations that continue to shape how the scaffolding industry operates and ensure that safety is paramount. Here at 7 Bays Scaffolding we are proud to be CISRS Qualified, fully CAA Approved and CSCS certified to give peace of mind to you and your project. All our staff hold valid CSCS health & safety cards and each crew is lead by a highly skilled and advanced scaffolder.